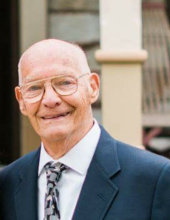 With great sadness we announce the passing of Lehman Memorial Church member, George Spalding. George died on April 25, 2018. George was predeceased by his wife Ruth, who passed away in 2009. George and Ruth were married for 56 years. Their wedding service was held at Lehman Church. Throughout the years, both George and Ruth were very active members of Lehman. George was a jokester who loved to make others laugh. He was well-known for his friendly, outgoing personality. George had an easy smile, a huge heart, and was always willing to help whenever needed. Please keep George's family in your prayers during this difficult time. Arrangements are being made by James R. Baskwill Funeral Home. Family will receive guests prior to the service at 10:00 a.m.
His burial will follow after the service at Whitemarsh Memorial Park : 1169 Limekiln Pike Ambler PA 19002. To share farewell messages online, please visit the funeral home’s website, www.baskwill.com. To send flowers or a remembrance gift to the family of George Spalding, please visit our Tribute Store. "Email Address" would like to share the life celebration of George Spalding. Click on the "link" to go to share a favorite memory or leave a condolence message for the family.